Tropical Storm Danielle forms | Watts Up With That? From the National Hurricane Center, word of the fourth tropical storm of the season forming. It’s a Cape Verde storm. Right now the wind forecast has it heading NW. EASTERN ATLANTIC HAS STRENGTHENED INTO TROPICAL STORM DANIELLE. ESTIMATED MINIMUM CENTRAL PRESSURE IS 1005 MB…29.68 INCHES. August 22, 2010 in hurricanes. There must be Thick prayer rugs down at the center. Remains to be seen where this one is headed. Models (oops! they are everywhere….lol) favor a Bermuda recurvature. If the mid-Atlantic ridge doesn’t develop, it will stay south and head for the GoM area. I don’t remember any time in the past when people actually WANTED to see hurricanes. Heck, just a few decades ago there was “promising new research” into ways of shutting them down, including detonating a nuke in the middle. Now, in this upside-down Topsy-turvy wacko world, there are a sizable number of people HOPING for devastating hurricanes just to “prove” their inane, repeatedly debunked hypothesis about climate. I can barely even imagine anything more pathetic. The models haven’t been handling this one very well. The potential for a strong/major hurricane is certainly there. The further west it tracks…the greater the risk it will not re-curve, and could impact the eastern US seaboard. And the low & high for the day: 57 & 68 F.
And it is very dry and dusty. All this is normal for mid-August. As is a Tropical Storm in the Atlantic. I don’t see anybody “HOPING for devastating hurricanes”. These are just predictions, the sort of thing that’s been going on for decades I suspect. This brings to mind those trying to sail the NW passage because we are told the arctic will soon be ice-free. It’s just as irresponsible to ignore the threat from hurricanes because they don’t fit your anti-IPCC stance. Mitigation helps but distance saves lives. I was thinking the same thing about the eastern seaboard. The jet stream is way up North but the rest of the upper level winds are quiet further South. It is possible that it could go North and I believe that more than I believe a tract into the gulf, but this one is hard to predict. I will keep commentators informed. Now I am more sure. Eastern seaboard it is. A Nor Easter but without snow! It is especially the formation of high pressure over New England/Maritimes that is a precursor for U.S. landfalls. One thing is certain, the continuing cycles of tropical cyclone activity are yet another nail in the [CO2] CAGW coffin. Me either. I really believe lots of “them” want as close to as many storms as they have predicted and they want them to hit the U.S. too. They are sick! Well nice try, HR, but not quite pathetic enough. Maybe you could try again? Implying that I somehow don’t “care” about hurricanes was a good start, but comparing sailing a closed passage with watching out for your safety was a real leap of logic. If you don’t know anyone “HOPING” for proof of AGW then you really must not know many people. The GOES EAST Water Vapor image is interesting. There is lots of very dry air ahead of the storm. The one way this storm would get headlines is to make landfall at Governors Island – that would be seen as complete proof of catastrophic global warming even if it was the only hurricane this year. It’s not about what’s best for individuals or humanity as a whole. It’s about having a “ha-ha, I was right” moment and using the victims or statistics (sometimes one in the same) as part of their cause. It’s about trying to erase the foolishness of quiet hurricane seasons of recent years. Kevin Trenberth said in one of the Climategate emails something along the lines of, “It’s a travesty that we can’t explain the lack of warming in the last decade.” I know people who feel the same way about hurricanes. They’ve been hung out to dry with predictions of active hurricane seasons and repeat events of Katrina, and they’re hungry for a sequel to give their position more traction. Yes, it’s sick. But so are they. Let’s remove hurricanes from the equation and just talk about global warming (which over the long run is supposed to do a lot more damage than just a few hurricanes, right?). If the earth remained at 2010 temps for the next 50 yrs – or even cooled – do you think all of the global warmers out there would be happy that their global crisis and claims of impending doom were a farce? FWIW, spaghettimodels.com’s links suggest Bermuda is in the mix but not the mainland US. Things could always change. That one has a whip on it! I would call that “cyclonic energy”. Timing off by a day or so but still pretty good for a layman. The delay might have been due to the breakdown of the South Atlantic dome. That allowed the disturbance to drift further south and out of the corridor higher than 10D North latitude. If the “earth’s temperature” stayed exactly the same for the next 100 years, NOAA could still be publishing their scary red dot charts – which are calculated relative to some arbitrary baseline period and colored for maximum shock effect. Forgive me my ignorance, but didn’t NOAA predict this year would have 1.7 million hurricanes? (OK, maybe I forgot the number they came up with, but it was high) And as this depression is named Danielle, that makes it the 4th “named” storm so far this year, correct? How many hurricanes have there actually been this year? Just when does the “season” end? Assuming it ends in say, November, doesn’t that mean there will have to be an endless string of hurricanes from here out for NOAA to have been even remotely correct? I seem to recall they issued a dramatic delay announcement in their yearly forecast due to a monkey predicting the same number they had come up with, and they delayed in order to check the monkey’s numbers… Or was that 5000 monkeys with 5000 models? 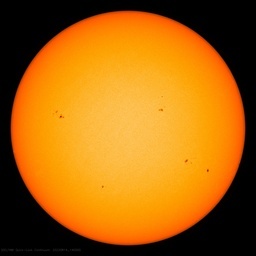 OT, but the sunspot number is now zero after a two-week downslope. I’d never make it as an activist (environmental or other) — whenever a storm forms I keep hoping it’ll curve and blow itself out at sea. I’m especially hoping that the first named storm of 2012 sort of meanders all over the place, makes a big show of itself without ever doing any serious damage — — the first name on the list for 2012 — Alberto (we can look forward to all sorts of Gore humor in 2012). Why hasn’t WUWT broke the NOAA satellitegate scandle? Stay with the people. > Now I am more sure. Eastern seaboard it is. A Nor Easter but without snow! A rule of thumb is that landfalling hurricanes pass to the left of 20°N 60°W . The early track (things depend a lot on the intensity of the storm) shows it heading well to the right of that point. Storms also tend to go around high pressure ridges, and http://www.nhc.noaa.gov/tafb/ATSA_18Z.gif shows one. It may be too far north to keep Danielle south to go around the 20/60 point. Steven, have you or anyone else commented on the fact that unit changes in anomaly are represented by dots whose area goes up by the square of the anomaly? Looks like Huff’s “How to Lie With Statistics,” again. No land fall for this one, if it goes to the east of Bermuda. Eventually the remains of this storm will end up here in the UK, most likely just after the bank holiday on Aug 30th. John GFS says about 3 sept!! We are having our first decent rains in two months in Southern New Hampshire. The trees are sighing in relief. However it’s no day on the beach, in Martha’s Vineyard. Winds may gust to fifty miles an hour there, this coming evening. Nothing unusual about this storm turning north away from the U.S. This is a link to historical tracks of tropical systems that have formed within 2 degrees of Danielle in august from 1851 – 2009. Currently solar wind speed ranges between 273 and 288 km/s, with low density. This means the atmosphere is low on ions, with a weak AA and K index. Unlikely that Danielle will become a major event unless the currently Earth facing coronal hole kicks into life in the next couple of days. Were they not supposed to name HURRICANES and not just depressions? An ironic thought: If it develops into a hurricane, tracks into the gulf, and oil slicks kill it, will anyone thank BP?